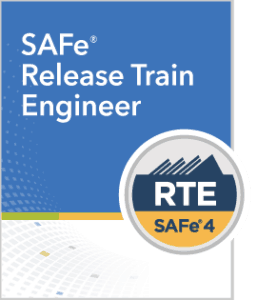 In this advanced three-day work­shop, you will gain an in-depth under­stand­ing of the role and respon­si­bil­i­ties of a Release Train Engi­neer (RTE) in the SAFe enter­prise. Through expe­ri­en­tial learn­ing, you will learn how to facil­i­tate and enable end-to-end val­ue deliv­ery through Agile Release Trains (ARTs) and val­ue streams. You will also learn how to build a high-per­­for­m­ing ART by becom­ing a ser­vant leader and coach, and how to plan and exe­cute a Pro­gram Incre­ment (PI) plan­ning event, the pri­mar­i­ly enabler of align­ment through­out all lev­els of a SAFe orga­ni­za­tion. Ear­ly Bird Dis­counts: Atten­dees that reg­is­ter for the course at least 30 days pri­or to the first day of the course may be extend­ed a CHF 200 dis­count.